After his extraordinary Bicycle Thieves, Vittorio De Sica and long time screenwriter Cesare Zavattini turned their neo-realist approach to something much more like a fable yet retaining the core ideas behind the revolutionary cinema movement. Miracle in Milan (Miracolo a Milano) went on to wow critics and audiences, winning the Grand Prize of the Cannes Film Festival in 1951. Always in the shadow of the ever more popular Bicycle Thieves, this largely unsung masterpiece tends toward magic realism to imagine a place where society's most downtrodden can find purchase and possible escape from misery. Set within a fantastically theatrical shantytown, Miracle in Milan constructs an alternate world from De Sica and Zavattini's fascination with marginalised perspectives. The unusual use of deliberate artifice and spectacle rekindles the Meliesian magical aura of early cinema. 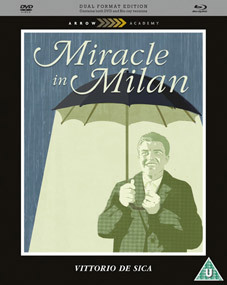 Miracle in Milan will be released as a dual format edition (1 Blu-ray and 2 DVDs) by Arrow Academy on 26th March 2012 at the RRP of £24.99. Comprehensive booklet including writing on Miracle in Milan and Il Tetto, a re-print of John Maddison's 1951 article The Case of De Sica, illustrated with original stills and artwork.